Several years ago when we were planning a trip to Austria I did a lot of research on the beautiful mountain and lake region of Carinthia where we intended to visit but ultimately did not. I see no reason not to share my information with others, even without being able to give firsthand recommendations. Of course I'll have to borrow a few Google images, since I don't have any photos of my own. What I found very appealing about this area, is the many, many bathing lakes (as opposed to the usually frigid lakes in the Alpine regions) ideal for families and children. 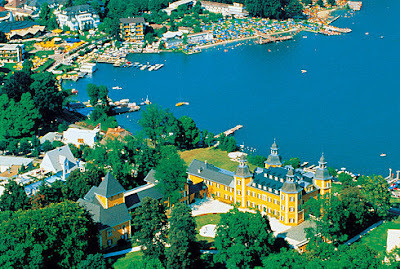 Seems the most popular are the Wörthersee (See means lake in German), Millstätter See, Ossiacher See and Faaker See. Klagenfurt, the capital of Carinthia, and Villach are the largest towns in the region and can be used as a home base for exploring other lakeside villages. Most train connections will come through Klagenfurt or Villach. There are also medieval towns like Friesach and Gmünd nearby if you prefer to station yourself in a smaller, more charming place. 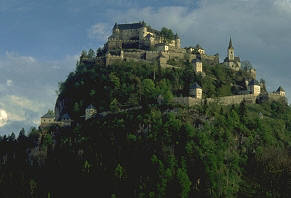 Besides sunny beaches on crystal-clear bathing lakes, in Carinthia you can explore cathedrals (Gurk or Maria Saal), abbeys (St. Paul's, Millstatt or Viktring), castles and palaces (Hochosterwitz, Griffin or Porcia). Me, in the back of the boat, with relatives on the Wörthersee in 1971. I love that you share pictures from your travels in Europe as a kid. Thanks for sharing this amazing and beautiful place. It has been a great help. Keep sharing and caring.